Over the past decade, an exciting development in implant dentistry has helped thousands of people who are missing all of their teeth, or whose remaining teeth cannot be saved, by providing an affordable alternative to traditional dentures and dental implant treatment. This procedure, called All-on-4 Implants ® can provide a full arch of replacement teeth, supported by just four strategically placed implants, usually without the need for bone grafting. 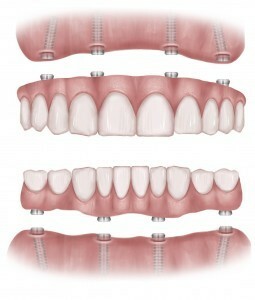 As shown in the illustration on the right, four implants are used to replace all of the upper teeth by tilting two of the implants to avoid the sinuses toward the back of the mouth. These tilted implants are longer than the other implants, providing strong support with only four implants, as opposed to placing additional implants to achieve that level of stability. Likewise, just four implants are used to replace all of the lower teeth by tilting two of the implants to avoid the nerve that runs through the back of the lower jaw. What Can All-on-4® Patients Expect? Following a consultation with a dental CT scan and diagnostic work up to determine if a New York City patient is a candidate for the procedure, the replacement teeth are fabricated using digital planning software. This allows Dr. Kissel to have the replacement teeth available to be placed on the same day the implants are placed. If you are considering complete tooth replacement with dental implants, the best way to determine what is right for you is to seek periodontist Dr. Kissel’s advice regarding all of your treatment options and then have him develop a personalized treatment plan with you. Contact us online or by calling the office in New York City at 212-702-9088.